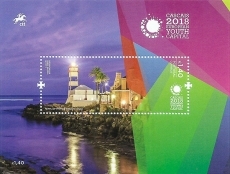 On 8 September 2017 Portugal issued a set of four stamps plus a souvenir sheet to celebrate the selection of Cascais as the 2018 European Youth Capital. Cascais is a suburb of Lisbon and the location of Santa Marta Lighthouse which is featured on the stamp in the souvenir sheet shown below. The light serves both for general navigation and as a front range light. It dates from 1868. This entry was posted in Lighthouses, Stamps and tagged Portugal. Bookmark the permalink.